Called the Remote + Mic Lightning Accessory Cable, Shure's latest iOS-only product is meant to bridge the gap as Apple transitions from 3.5mm to Lightning. Without a 3.5mm-to-Lightning converter, or in this case a direct cable replacement, Shure's audiophile equipment is incompatible with Apple's latest iPhone 7 handsets. Along with the usual inline microphone and system controls —volume and a multifunction button —Shure built in a specially designed DAC that plays nice with the company's existing headphone lineup. Apple's Lightning protocol transports digital data from iPhone or iPad, meaning connected devices have to supply their own conversion hardware. Apple itself integrated a DAC into the gratis EarPods that ship with iPhone 7. Shure's cable should benefit from improved sound fidelity as compared to the 3.5mm-to-Lightning adapter Apple includes with every iPhone 7 box, especially considering the highly sensitive earbuds it serves. Whether that perceived boost in sound quality is worth the cable's steep price of admission has yet to be seen. 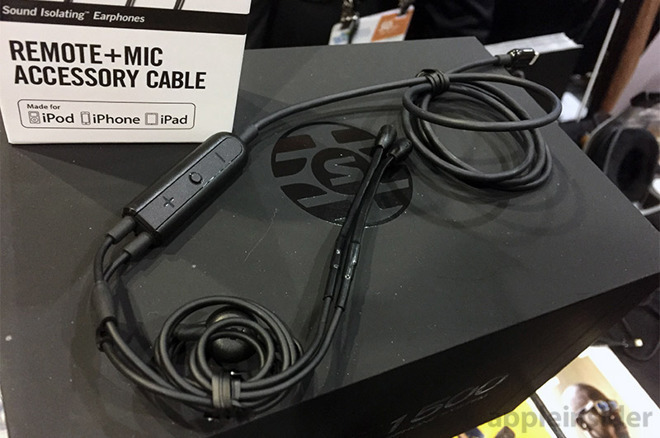 Shure's "Made for iPhone" Lightning cable is priced at $100 and will work with the SE215, SE315, SE425, SE535 and SE846 when it ships this spring.